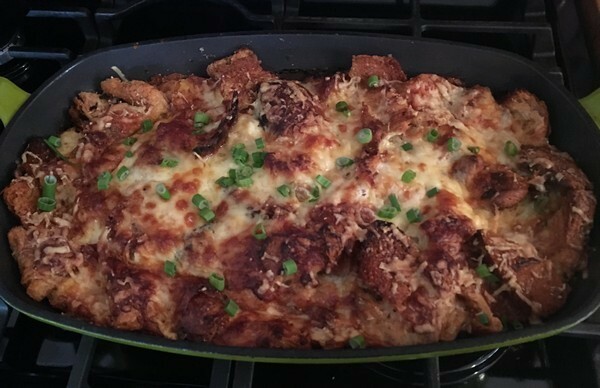 Just before Christmas the NY Times ran a recipe for what was basically a savory bread pudding or strata. 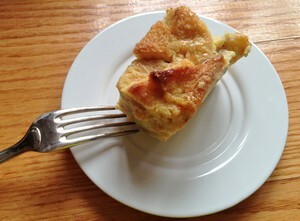 Now, the Accidental Locavore isn’t sure exactly what the difference is, other than more people seem to be able to relate to the idea of bread pudding. I thought this would make a good breakfast for a crowd. If you can start it the night before, you’ll benefit from it sitting around overnight so the bread can absorb the liquid. Serves 8. Heat oven to 500°. 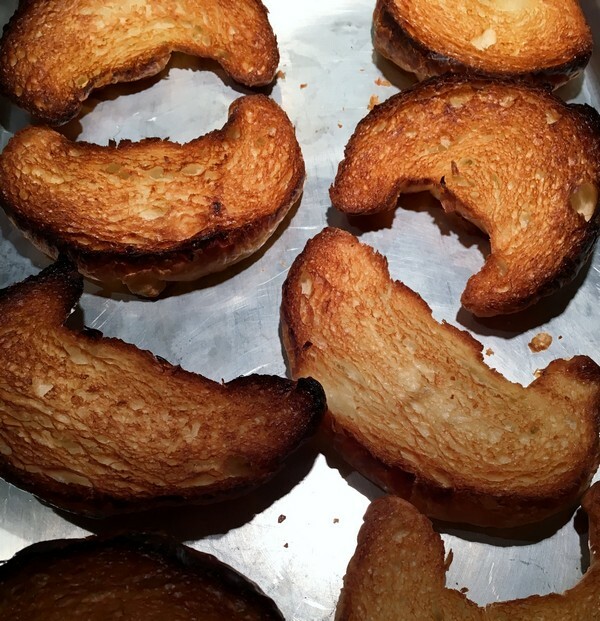 Spread croissants on a large baking sheet and toast, cut side up, until golden brown, 5 to 10 minutes (watch very carefully to see that they do not burn). 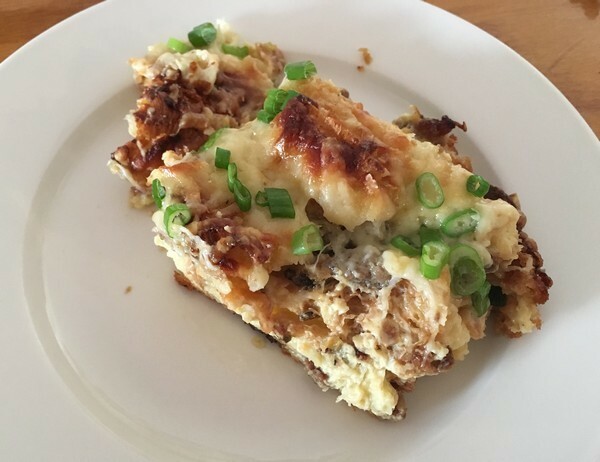 Let cool, then tear into large bite-size pieces. In a medium sauté pan over medium-high heat, warm the olive oil. 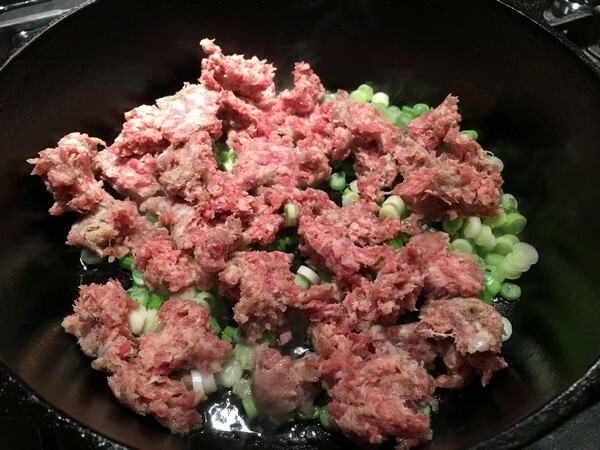 Add sliced scallions and sausage meat; cook, breaking up meat with a fork, until mixture is well browned, about 5 minutes. Stir in sage, and remove from heat. When you’re ready to bake the casserole, heat oven to 350 degrees. 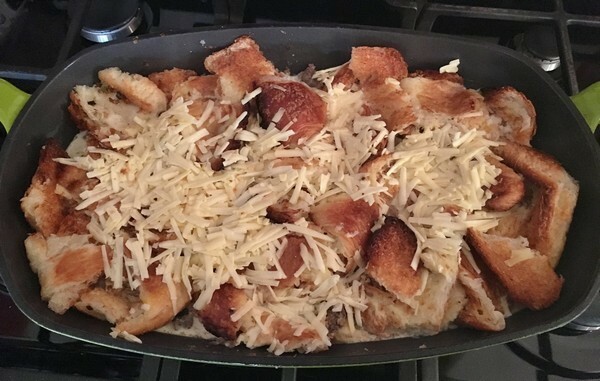 Scatter the remaining grated cheese over the top of the casserole. Transfer to oven and bake until casserole is golden brown and firm to the touch, 45 minutes. Let stand 10 minutes. Garnish with sliced scallion tops, serve and enjoy! My verdict: Great! I substituted some good Southern breakfast sausage for the Italian and it was delicious. While the croissants I used were just okay, if you could find some good ones (Maison Kayser), it would make it a better dish. You could add or substitute all kinds of goodies, smoked salmon, mushrooms are a few that come to mind. It was also good to just be able to pop it in the oven on a busy morning. As the Accidental Locavore was writing about No. 9, it occurred to me that I’m a little fussy about desserts. First of all, savory foods interest me much more than sweets. A plate of cheese is my favorite dessert in France (and most of the rest of the world, if they can get it right). And there’s a whole category my friend Leslie refers to as “beige, toothless desserts,” or food that jiggles, that I can easily live without. 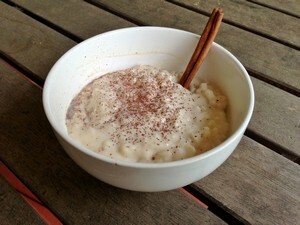 This includes all of what we Americans consider puddings: rice, tapioca, bread, etc. In the jiggly category, you can pile on: crème brûlée, flan, custards and Jello. In the French (but not cheese) area add isle flottante, oeufs a la neige. And finally in the cream section, toss in crème caramel, crème Anglaise, crème Chantilly (whipped cream – but it does sound better in French, n’est pas?). Another easy target for the list: Asian sweets. Not only are most of them almost unbearably sweet, but they almost all fall into the toothless category. And as much as I love vegetables, do not think you can tempt me with cakes made from root (or other) vegetables. Carrots and zucchini should be eaten as part of the meal, not afterwards. So, what rules? Chocolate, of course, but please don’t add anything to what is essentially a perfect product. That includes: chipotle, cayenne or coffee, to name a few recent villains (and white chocolate, besides being beige, isn’t even really chocolate, so fuggedaboutit). Fruit, in season, especially when that season is summer, is sublime. I love peaches and apricots and really love them cooked! Pies, tarts, crumbles or even grilled, it’s really hard to mess up great fruit! Almost anything frozen. Come on, is there anything better on a warm night than ice cream! I’m still a kid at heart, so walking down the street, eating an ice cream cone always brings a smile to my face. And it is the one of the few exceptions to the beige dessert rule (cheesecake being the other). Sorbets, gelatos, even the-trendy-last-summer ice pops, are all good. And in the winter? Back to chocolate, possibly an apple pie (especially if it’s as good as my cousin’s caramel apple) or simply waiting for that first warm night and that anticipated bite of ice cream.